Forever Manchester to be charity partner at We Are Lager Festival. We are delighted to announce that Forever Manchester will be official charity partner at the We Are Lager Festival. The four day drinks festival takes place from Thursday 4th to Sunday 7th April at one of Manchester’s most iconic Victorian buildings, Upper Campfield Market on Deansgate. Music will be provided throughout the festival by a stellar line up of DJs, including Everything Everything, Luke Unabomber, Gareth Brooks and ACR. Tickets are available to purchase here. 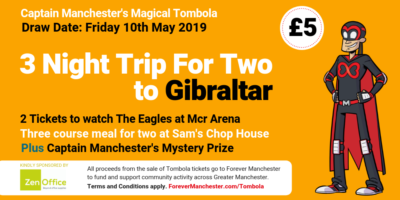 If you enter the code ‘forevermanchester’, £2 will come to Forever Manchester to help us fund and support community activity across Greater Manchester.